We always stock a full line convertible tops, glass & Plastic Windows. German Loop Carpet, English Wilton Wool, Porsche Slivernet, Rolls Royce Carpet, BMW Velour Carpet and much, much more! Global is your single source for Leather and Vinyl. We offer a variety of Leather/Vinyl matches as well as perforations. We can Perforate any material under 3mm thick. Our materials are ideal for wide spectrum of applications, such as, automotive, aircrafts, boats, furniture, and motor homes. Leather for Acura, Aston Martin, Audi, Bentley, BMW, Chrysler, Ferrari, Ford, GM, Honda, Infinity, Jaguar, Lamborghini, Land Rover, Lexus, Maserati, Maybach, Mini Cooper, Mercedes, Porsche, Rolls Royce, Saab, Toyota, Volkswagen, Volvo plus Euro Autolux, Ostrich Grain Cowhide, Reno Leather, and more! We offer a variety of fabrics ranging from OEM fabrics such as German & English wool body cloths to near leather suedes!!! Imported Wool Broadcloth, Imported Porsche Vinyl and Cloth Headliners for Convertible and Hard Top, Imported BMW, VW, Mercedes Vinyl and Cloth Headliners and more! 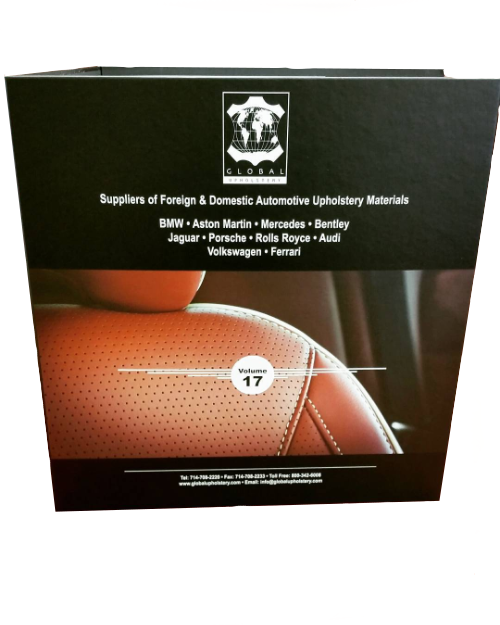 Global Upholstery Supply's Foreign & Domestic Automotive Upholstery Materials Volume 17. 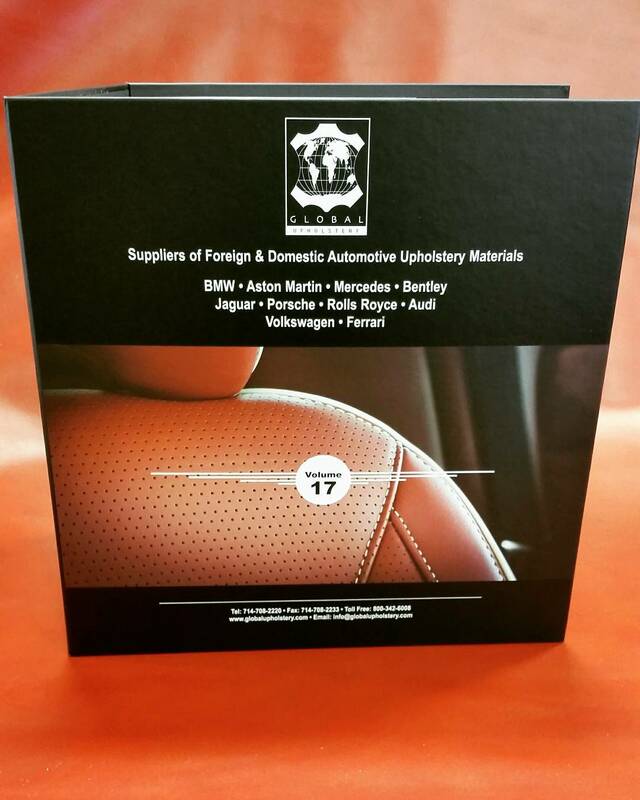 This giant binder has 21 complete selections for Mercedes, BMW, Porsche, Rolls Royce, Jaguar, VW and much more!